NEW YORK, NY--(Marketwired - Jun 7, 2013) - On June 5, 2013 the International Center for Autism Research and Education (ICare4Autism) held the conference, "Autism: Cutting Edge Research and Promising Treatment Approaches," at Albert Einstein College of Medicine in conjunction with Montefiore Medical Center. From neurology to psychology and everything in between, the speakers presented studies on the many aspects of autism research and treatment methods. Dr. Eric Hollander, Director of the Autism and Obsessive-Compulsive Spectrum Disorders Program at Albert Einstein College of Medicine/Montefiore Medical Center and Chairman of the ICare4Autism Advisory Council, discussed Inflammation, Temperature and Personalized Therapeutics of ASD. Martha Herbert, M.D., Ph.D., of Harvard Medical School and the Massachusetts General Hospital, presented her research, Taking a Fresh Look at Autism: Chronic Dynamic State, not Fixed Trait. Dr. Herbert is the Director of the TRANSCEND Research Program (Treatment Research and Neuroscience Evaluation of Neurodevelopmental Disorders) with key interests in the concept of autism as a "dynamic encephalopathy (changeable) rather than a static encephalopathy (fixed for life)." Dr. Gary Steinman, Chairman of the Department of Biochemistry at Touro College of Osteopathic Medicine, presented Diagnosis and Treatment of Autism at Birth. Dr. Steinman's studies suggest the potential for addressing autism by looking at the role of depressed IGF (insulin-like growth factor) at birth. He is collaborating internationally to develop a protocol for early identification of autism. Non-verbal until age 4 and diagnosed with autism himself, Dr. Stephen Shore of Adelphi University presented Special Ways and Techniques (SWAT) for Achieving Meaningful Inclusion. Dr. Shore is a self-advocate who promotes early intervention and educational strategies to embrace difference and access learned knowledge through unconventional, yet creative and effective, means. 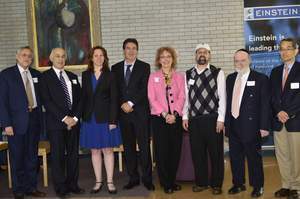 Other presenters included Dr. Carlos A. Pardo, Dr. Theoharis C. Theoharides, Dr. Aleksandra Djukic, Dr. Nathaniel Heintz, Dr. Sophie Molholm and Dr. Alisa G. Woods. The event is now available to view on Autism Brainstorm's website, http://www.autismbrainstorm.org as well as ICare4Autism's website, www.icare4autism.org. ICare4Autism is a New York City based non-profit organization that works to facilitate communication and collaboration between medical and educational specialists worldwide with the aim to alleviate autism spectrum disorder. Together we can uncover the etiology of autism, design successful intervention strategies, and innovate sustainable inclusion practices for persons with autism.